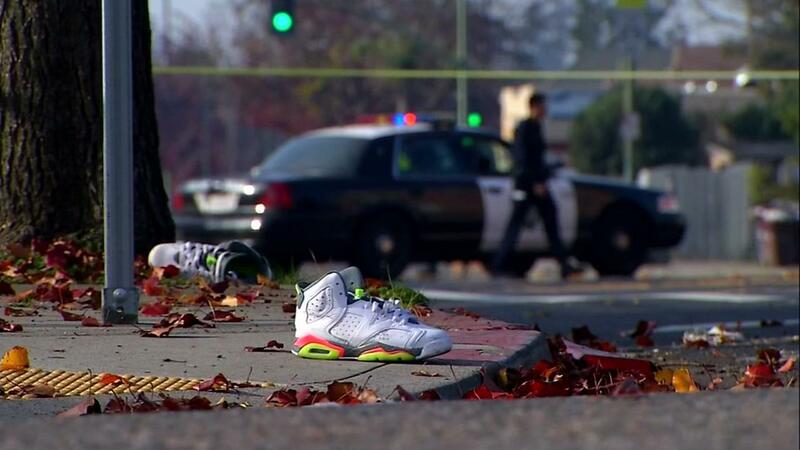 Victim’s shoes in Oakland crosswalk. On New Year’s Day, 62 year-old Yanfren Zhao was killed in an East Oakland hit-and-run. The incident was reported at 2:24 a.m, on 98th Avenue and Sunnyside Street. Zhao was crossing the street from Cox Elementary School. Zhao suffered severe head injuries and was taken the Highland hospital where she later died. Police said, speeding down the hill may have been a part in the collision. Neighbors said they have complained about people speeding down the hill for a long time. According to witnesses, the suspect was driving a four-door dark Sedan. Police don’t know whether or not if alcohol or drugs may have been the reason for the killing of Zhao. Pedestrians said they’ve always had problems crossing the street because, people have almost run them over. Neighbors said they think the main problem for speeding is because its closeness to the freeway. 98th Avenue was closed for eight hours as investigators tried to piece together evidence about the hit and run. 98th is a major thoroughfare between the Interstate 580 and 880 freeways in Oakland. Oakland police and Crime Stoppers of Oakland are offering a $10,000 reward for information related to the collision. Anyone with information may call police at 510-777-8570 or Crime Stoppers at 510-777-8572.